Do you find that you are feeling anxious much of the day or that you feel anxious about certain topics or situations? 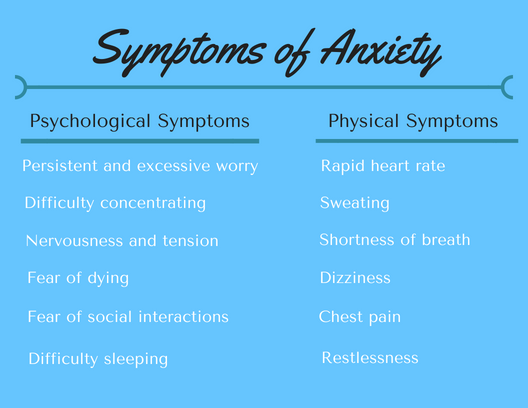 Anxiety can cause panic attacks and physical symptoms that feel very scary and uncomfortable. It can make you feel like you don't want to socialize or leave the house. Anxiety can be very debilitating and interfere with truly enjoying life. Our licensed therapists are well trained in clinical and research based treatments that can help you make changes in your life and decrease the anxiety that you are feeling. You don't have to continue to suffer alone with your worrisome thoughts and feelings. Contact us today and together with your therapist you will create a tailored plan to move you toward being anxiety free!